Laparoscopic splenectomy is a technique whereby the spleen can be removed using several small incisions. Traditionally, removal of the spleen has been accomplished using one larger incision. The use of smaller incisions leads to less pain after surgery, less time in the hospital, and a quicker return to work and full activity. This specialized procedure cannot be performed on all patients who need spleen removal surgery. Prior to splenectomy patients usually are immunized against a variety of bacterial organisms. This decreases the chance of developing serious infections after splenectomy. Typically these immunizations are ordered by the patients hematologist prior to referral. If you have not received these injections notify Dr. Fusco during your preoperative consultation. Depending on your age and medical condition you may be required to undergo preoperative testing. This may include blood work, x-rays, and an electrocardiogram. The office will arrange this and give you instructions when you schedule your surgery. Patients will also be given a prescription for pain medication. It is recommended that you fill this prescription prior to the day of surgery. It is very important that you do not eat or drink anything after midnight the night prior to surgery. This includes coffee, water, mints, gum, candies. You may ingest only a small sip of water with your morning medications. Dr. Fusco's office staff will advise you when to arrive at the hospital. Since the procedures scheduled prior to yours may be longer or shorter than anticipated, we ask that you remain available prior to your arrival time so that you can be contacted and informed of any changes in your surgery time. When patients bathe the night prior to surgery they should thoroughly cleanse the umbilicus (belly button). The surgery is done under general anesthesia (completely asleep). Using the inserted instruments the attachments and blood supply of the spleen are divided and the spleen is mobilized. The spleen is placed into an extraction bag. The spleen is then broken into smaller pieces while still in the bag. This is then removed from the small extraction incision. The incisions are closed with absorbable sutures. Steri strips (butterfly stitches) are placed. These remain on the wounds until they peel off on their own, usually in two weeks. The wounds are covered with Band-Aids. These Band-Aids can be removed the day after surgery. Patients are allowed to bathe normally the day following surgery. The surgery is done as an overnight stay in most patients. The remaining patients typically go home the following day. Patients can resume light daily activity immediately. Most patients after laparoscopic surgery will experience a sharp shoulder pain that resolves after 2-4 hours. It is important that patients get out of bed and go for a walk as soon as possible (the night of surgery), to improve lung function and decrease the risk of abnormal blood clots. The average patient will require 1-2 weeks recovery before resuming more vigorous activity. There is no forced limitation of activity, instead patients are asked to advance their activity as tolerated. This applies to the resumption of work, sports, and sexual activity. Patients are given a clear liquid diet the night after surgery. The morning after surgery they are given regular food as tolerated. Nausea or vomiting that persists for greater then 24 hours after surgery - nausea shortly after surgery is commonly due to general anesthesia and usually resolves within this time period. Temperature greater than 101.5 degrees - Temperature elevations less than this are very common after surgery and usually have little significance. Pain that is not relieved by the oral pain medication prescribed. Patients experiencing any difficulty breathing, chest pain, change in level of consciousness, or loss of vision or strength should promptly call 911 for transport to the nearest emergency department. Any patient who undergoes laparoscopic spleen surgery may need to be converted to the open surgery. The risk of this varies significantly depending on the size of the spleen and a variety of patient factors. (Previous surgery, medical condition, weight) Dr. Fusco can estimate the likelihood of completing the surgery laparoscopically during the preoperative consultation. Since splenectomy is performed for numerous conditions, the likelihood of splenectomy improving or curing the condition varies significantly depending on the condition being treated. OverwhelmingPost Splenectomy Sepsis (OPSS) - infection that can occur even years after splenectomy. Occurs in less than 1% of cases. After splenectomy patients need to be closely monitored for this infections and should call there physician if they have any febrile illness. What are the Symptoms for Laparoscopic Splenectomy? You may notice that you bruise easily and that the bruises take a long time to disappear. An enlarged spleen may have been felt by your doctor during a physical examination or seen on an x-ray. Perhaps you have had an unexplained infection somewhere and through diagnostic testing, a problem with your spleen is discovered. What are the Indications for Splenectomy? What are the Contraindications for Laparoscopic Splenectomy? Laparoscopic removal of the spleen is not recommended for cases of trauma because intra-abdominal bleeding interferes with the surgeon's ability to visualize the blood vessels and splenic attachments. Spleens which are massively enlarged may also pose a problem for the surgeon because the size of the spleen restricts the visualization and manipulation of the spleen. Portal hypertension is usually another contraindication to any type of splenectomy. Laparoscopic splenectomy is the surgical removal of the spleen. It differs from the traditional 'open' technique in that the procedure is performed through small incisions. This usually allows a much faster recovery and is significantly less painful. How is Laparoscopic Splenectomy Done? Laparoscopic splenectomy is a surgical technique used to remove the spleen without making a large incision. You will be given general anesthesia. After you are asleep the anesthesiologist will probably insert a temporary tube into your stomach to empty it. This will help to decompress the stomach and prevent post-operative nausea. A catheter will be inserted into your bladder to drain the urine while you are asleep. Surgery may be done with you lying flat on your back or turned onto your right side depending on surgeon preference. 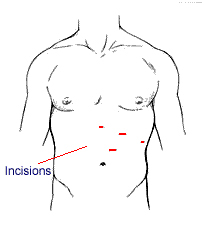 Several small incisions are made into the abdomen. One is used for the laparoscope which is attached to a camera that sends images to a video monitor. The other incisions are used to hold or manipulate tissue in the abdomen. Carbon dioxide gas is insufflated into the abdominal cavity to allow room to work and to allow the surgeons to see. Parts of the spleen are freed from surrounding tissue. Blood vessels to the stomach and spleen are visualized, tied off or clipped with metal clips and divided. Once the spleen is dissected free of its attachments in the abdominal cavity, it is placed in a special surgical plastic bag and removed through one of the small abdominal incisions. If the spleen is too large to be removed in one piece, it will be broken up in the bag and removed as smaller pieces. At the end of the surgery, carbon dioxide gas is removed. The small incisions are closed with suture, the skin is cleaned and the incisions are covered with a small dressing. What are the Risks of Having Laparoscopic Splenectomy? Splenectomy, either open or laparosocopic, is a safe procedure. As with any other surgical procedure however, complications may occur. The risk of surgery is also related to the disease process for which the splenectomy is being performed. If there is an accessory (extra) spleen and it is not seen during the original laparoscopic procedure, a return to surgery may be necessary to remove it. You and your surgeon should discuss the potential complications in more detail. Sometimes it is not possible for the surgeon to use the laparoscopic technique because it may be difficult to see or handle the organs safely. The surgeon may decide to convert the laparoscopic surgery to an open procedure in certain situations and for patient safety. Though very infrequent, when conversion to an open technique occurs, it should not be considered a failure of the procedure. 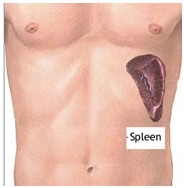 Open splenectomy would require hospitalization for 3-7 days and 2-6 weeks for a full recovery. In other situations, one of the small incisions may be enlarged some for better handling of the spleen. This is called 'laparoscopically assisted' or 'hand assisted laparoscopic splenectomy' and is particularly helpful in the very large spleens. A thorough medical evaluation will be made by your physician. Several diagnostic tests may be needed. You may have blood tests, an electrocardiogram (EKG) or chest x-ray to check your heart and lungs. You may be given prophylactic vaccines prior to surgery. You may be asked to donate 2 units of your own blood to be given postoperatively if necessary. If you have a deficiency in platelets (a clotting component of the blood), your physician may reserve platelet units in the blood bank for you or give you corticosteroids or gamma globulin to increase your own platelets. Taking no food or liquids after midnight the night before the surgery. This decreases the risk of vomiting after you receive anesthesia. If taking medications daily, discuss the need to take them with your doctor prior to the morning of surgery (with a sip of water). If taking blood thinners, aspirin or arthritis medications, discuss the proper time to stop these medications before the surgery date (day). Receive a small needle/catheter in you vein to provide medication before, during and after your surgery. Receive preoperative medications as necessary. Going to the recovery room after surgery and having your blood pressure, pulse, and respirations closely monitored until you are fully awake. Experience mild to moderate post operative pain and having pain medication available as needed. There is usually some shoulder pain secondary to the insufflation of the abdomen. Having any stitches removed depending upon the type your physician uses.